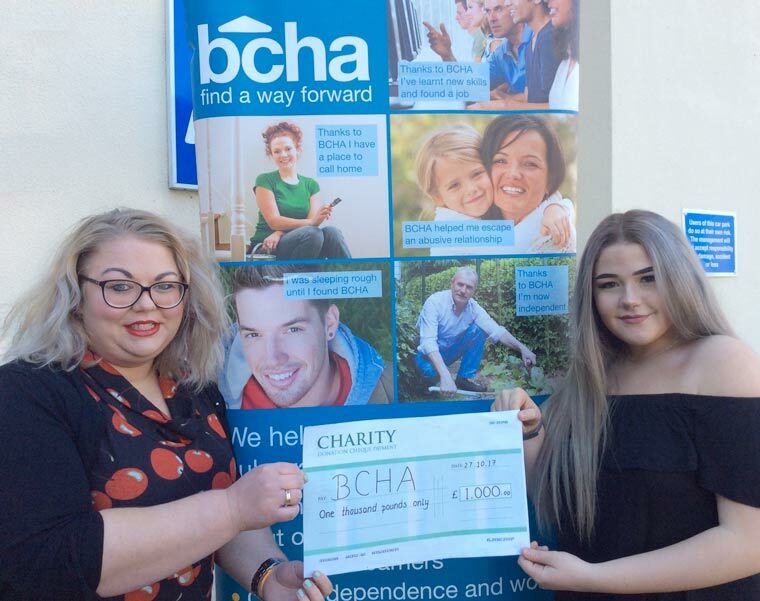 A 16 year-old Bournemouth and Poole College student delivered a cheque for £1,000 last week to BCHA following a successful fundraising launch event for her charity CD single release. Nicole Mcnally wrote, recorded and released the track entitled ‘Annabelle’, which is about a woman trying to escape domestic abuse, to raise money for the Bournemouth Women’s Refuge, which is run by local housing and support provider BCHA. Rather than just release the single, Nicole decided to organise a special music event and called upon her local contacts, managing to persuade 16 artists to perform for free and help raise more money for the refuge. The all-day event took place at Chaplin’s Cellar Bar in Boscombe and featured Matt Black, Si Genaro from The Voice, Jonny Phillips, Kimari Raven, Matt Griffiths, Ant Lewis and Nicole McNally herself. Naomi James, from BCHA’s Bournemouth Domestic Abuse Service, said, “We are absolutely overwhelmed by what Nicole has achieved for the women’s refuge and the money will go towards converting a garage at the refuge into a computer room for the children. Nicole has been performing in public since she was 10 years old and over the past six years has taken part in hundreds of live music events, talent competitions, musical theatre productions and private gigs, performing at local venues including The Pavilion, O2 Academy and Lighthouse, as well as the Queens Theatre and Royal Albert Hall in London. Last year she was a featured artist on BBC Introducing Solent radio show. The former Avonbourne college pupil was motivated to write ‘Annabelle’, after she learnt about domestic abuse during one of her school lessons. Nicole said, “I was inspired to write the song after reading and discussing the topic during Domestic Violence Awareness Month. After playing the song a few times locally and seeing the reaction it received from several survivors, which promoted them to share their own experiences with me, I decided to release ‘Annabelle’ as a charity single and host the event. Details of how you can purchase the single can be found at Nicole Mcnally Official on Facebook.